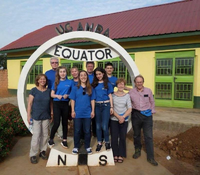 The equator that crosses through Uganda approximately 72 kilometers south of Kampala, along the Kampala – Masaka road, which has become a famous visit destination for visitors and tourists visiting Uganda. It has also become a booming hub made up of several craft shops and art galleries that sell souvenirs and handmade products about the equator including T-Shirts with words “I crossed the Uganda Equator”. Besides, there are nice restaurants with delicious food and good coffee. The equator traverses the land and territorial waters of 14 countries and seven of them are in Africa. Uganda is one of the few countries in the world that the equator intersects. It must be noted that equator is one of the five notable circles of latitude on earth, the others are– the two polar circles and the two tropical circles – the tropic of cancer and the tropic of Capricorn. Fascinatingly, the equator is the only line of latitude that is a great circle. While at the Equator, tourists have a chance to see an experiment of how water drains straight down at the Equator. You can stand on the Equator with one foot in the northern hemisphere and one in the southern hemisphere and be in both sides of the world. Because the Earth bulges at the Equator due to the effects of rotation, gravity is reduced. Thus one weighs about three percent less than normal, but of course upon leaving the Equator one's weight returns. At the equator, the sun rises and falls quickly, with equal number of hours in day and nighttime. The weather and temperature around the equator is stable throughout the year making it a nice place to be at. Water runs down in sinks clockwise in the Northern hemisphere and counterclockwise in the Southern hemisphere and right on the line the water goes straight. Scientists say that areas on the equator experience the quickest sunrises and sunsets. Since the sun rises and sets almost vertically throughout the year, the length of a day from `sunrise to sunset` at the equator is almost constant during the year. Each day is about 14 minutes longer than night because of atmospheric refraction. March 21 and September 23 are equatorial equinox days where the sun rises and sets directly above the equator line at midday on these two days; you will not see your shadow because the line is straight up.